Supported culture systems are particularly important in organic tomato production to reduce disease problems and fruit rotting, whether in high tunnels or in field production. In spite of the associated labor and material costs for training tomatoes, the benefits of increased air circulation and reduced contact with the soil are significant. Training and pruning organic tomatoes, which improves air circulation through the plant, is especially important in humid climates where tomatoes are particularly susceptible to disease. A management strategy such as supported culture, that reduces disease problems, is even more important in organic tomato production because of the limited availability of effective organic control products once a problem occurs (Diver et al., 1999). Several different tomato training systems exist, and in selecting which to use a grower must decide whether to support tomato plants (via stakes, trellises, or cages) and whether to use a surface mulch (plastic or organic). These are decisions to consider before planting, as the training and mulching systems selected will impact plant spacing and field design. Staking tomatoes improves fruit quality by keeping fruit off the ground and inceasing air flow through the plant. A structured training system can also make tomatoes easier to harvest. However, staking systems require an investment in materials and labor, so the benefits of these costs must be evaluated. Tomato plants grown unsupported require less hands-on management throughout the season, but may be more susceptible to weeds and diseases, particularly if they are grown on bare ground. Determinate varieties are often successfully grown unsupported but with a mulch. Supported culture systems provide a physical structure on which tomato plants grow. Staking systems are usually installed 2-3 weeks after transplanting or when plants reach a height of 12-15 inches. At the same time, plants are usually pruned to reduce vegetative growth and to encourage strong fruit production (see Pruning). The three most common supported training systems for field grown tomatoes are stake and weave, trellis, and cage. In any of these systems, care must be taken to use materials for structural support that are approved for use in organic agriculture. The National Organic Program (NOP) Final Rule declares that "the producer must not use lumber treated with arsenate or other prohibited materials for new installations or replacement purposes in contact with soil or livestock" ( (United States Department of Agriculture [USDA], 2000). This restriction applies to the use of posts, plant stakes, trellising, and frames of planting beds used in fruit and vegetable production (Gegner, 2002). 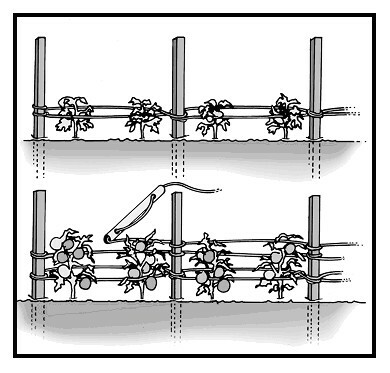 In this training system, wooden or metal stakes are driven between every other tomato plant. Lines of twine are strung between stakes on either side of the plants to provide support. Indeterminate varieties require longer stakes (5-6 feet) than determinate varieties (3-4 feet.) although the growth habit of your specific variety will help determine stake length. Wooden stakes should be at least 1” square to provide strong support throughout the season. Metal stakes can be of a smaller diameter, and have the advantage of being reusable from season to season. Cut pieces of concrete reinforcing rods make excellent stakes. Twine must be resistant to weather and stretching, and have sufficient "grip" to wrap tightly around stakes. Drive stakes 8-12 inches deep between every other plant, leaving about 4 inches of space between the stake and the main plant stem. String the first line 8-10 inches above the ground by securing the twine to an end stake, and wrapping the twine around each stake until the row is completed. Loop around this end stake and complete the stringing on the other side of the plant row. Run the next row of twine 6-8 inches above the first row before plants begin to fall over. Most determinate varieties can be supported by 3-5 lines. A variation of this system called the Florida weave establishes the first line by weaving from one side of the plant row to the other, alternating around each stake. The first line is attached from the end stake to the next stake, wrapping that stake and crossing the row to reach the following stake on the other side of the plant row forming a figure 8 pattern down the row, and returning in the opposite figure 8. Often only the first line is woven in this manner, and subsequent lines run straight down each side of the plant row. Trellising is used to train indeterminate tomatoes. The system consists of heavy gauge wire strung horizontally across the top of widely spaced, sturdy (3-6 inch) support posts. Lengths of twine are dropped from this top wire and secured to the base of each tomato plant (or to a bottom wire, if used). The plants are trained to two main stems, and each stem is wound around a length of twine as the plant grows. Support posts should stand 5-6 feet above the soil and be spaced 12-20 feet apart down the row. The fruit of trellised plants is more susceptible to sunburn because of the reduced canopy and greater sun exposure. The plants may produce fewer fruits but these are larger and ripen earlier than plants trained in other ways. Caging is a support system that requires less work than staking or trellising, but provides similar benefits in protecting plants from contact with the soil. Cages can be made from sections of 6 inch wire mesh. A 5 foot length of mesh can be folded into a cylindrical cage with an 18 inch diameter. The cage can be supported by a stake, or if the bottom cross-wires are cut out the cage can be pressed into the ground on its wire "feet." For indeterminate varieties, cages should be 5 feet high; determinate varieties can be grown with shorter cages. Caged plants are pruned lightly or not at all. Growing branches should be lifted or turned to be supported by the wire. Tomatoes can be harvested easily through the 6 inch mesh. Caged plants may not produce ripe tomatoes as early as staked or trellised plants, but they produce more tomatoes that are less likely to suffer from cracking or sunburn. Some growers creatively use other materials to train tomatoes. Sections of open wire mesh (hog wire) can be placed 8-10 inches off the ground to form a tabletop-like support for plants. The mesh should be cut 2-3 feet wide and laid the length of the row, parallel to the ground and resting on "H"-shaped supports. Install this support while plants are still small. As plants grow through, their branches will lay out onto the wire mesh for support. Some growers elect to grow tomatoes on the ground unsupported, a simple method that goes by many different names: sprawl culture, the down system, ground culture. This system is more commonly used with determinate tomatoes since their bush habit and limited tip growth require less support. The principle advantage of sprawl culture is the lower cost, because materials, labor, and time are saved by not installing physical supports and training plants. However, compared with supported systems, sprawl culture results in lower yields, lower fruit quality, and higher incidence of disease. Weed pressure can also be high if unsupported plants are grown on bare ground. The sprawling habit makes weeding difficult. The use of mulches, either plastic or organic, in sprawl culture reduces disease problems by minimizing soil contact with leaves and fruit. In addition, mulches help conserve moisture by providing a barrier to prevent rapid soil drying. The physical barrier also inhibits weed growth by blocking sunlight. Black plastic mulches warm the soil, improving plant growth early in the season. Plastic mulch is often used in combination with drip irrigation. In regions where crops are dependent on summer rainfall, growers who choose not to install drip sometimes punch holes in the plastic to allow rain infiltration. However, this weakens the plastic and increases problems with tearing and weed growth. Organic mulches such as straw, cool the soil and might slow early season growth. Later in the season, however, when temperatures are high the cooling mulch may benefit the plants. An advantage of organic mulches is their ability to decompose over time which provides organic matter to the soil and improves soil quality. Researchers at Oklahoma State University examined the economics and performance of four differenet tomato training systems (Motes 1987). Their findings are summarized below (Diver et al., 1999). (2) Cage—2 foot tall wire cage 14 inches in diameter made from No. 10 mesh on 6"x6" spacing. (3) Stake and Weave—Stake is driven between every other plant and twine woven between and around stakes 4-6 times. All suckers but one below the first fruit cluster are removed. No other suckers are removed above the first cluster. (4) Trellis—Posts support No. 10 wire. Strings are dropped from wire and tied to base of plant. Plants are twined around string. The main stem and one sucker are allowed to develop and all other suckers are removed as they develop. There are few hard and fast rules in tomato pruning, and many varying opinions. Good pruning achieves the optimum balance between vegetative growth and fruit production. Pruning will impact fruit size, fruit quality and yield, so it is important to strike the right balance between reducing vigorous foliage and stripping the plant. Good pruning helps increase fruit size and enhance earliness. However, pruning too heavily can reduce yield and increase problems with sunburn, blossom end rot, and catfacing. In determining how to prune your tomato crop, consider the growth habit (determinate or indeterminate) of your plants. Indeterminate tomatoes are more heavily pruned than determinate ones, but even determinate tomatoes often require some level of pruning. Next, consider any special features of your specific variety including any recommendations from your seed supplier. The amount of pruning needed can vary with variety. Pruning is usually started as the plants are first being staked or supported, sometimes before stringing them to avoid interference with the lines. Tomato plants are pruned by selectively removing suckers, the shoot that grows between the main stem and a leaf. Suckers should be broken off while they are still small, between 2-4 inches in length. Prune plants only when the leaves are dry to reduce the spread of disease. 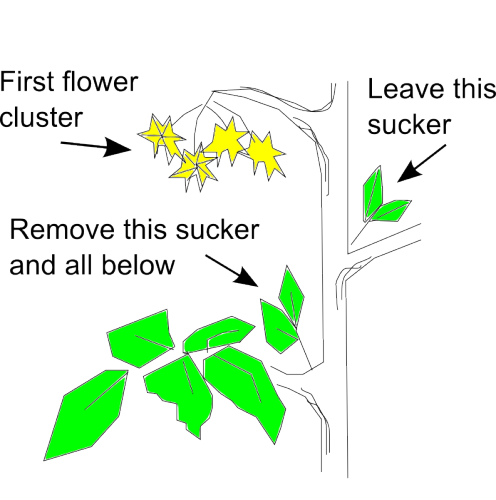 Plants in the trellis system are generally trained to two stems: the main stem and the stem that develops from the sucker just below the first flower cluster. Suckers below this one should be removed. The remaining two stems should be twined around the vertical string support as the plant grows. If very vigorous plants grow above the top of the stake system, they may need to be topped. Suckering diagram. Figure credit: John McQueen, Oregon State University, adapted from Kemble et al. 2000. Diver, S., G. Kuepper, and H. Born. 1999. Organic tomato production [Online]. National Center for Appropriate Technology (ATTRA) Publication #CT073/149. Available at: http://attra.ncat.org/attra-pub/tomato.html#training (verified 3 March 2010). Gegner, L.E. 2002. Organic alternatives to treated lumber [Online]. #CT170. 2002. National Center for Appropriate Technology (ATTRA). This publication is being revised. For more information see http://www.attra.org/attra-pub/summaries/lumber.html (verified 4 April 2011). Motes, James E. 1987. Tomato production cost comparisons. p. 7-10. Proceedings of the 6th Annual Oklahoma Horticultural Industries Show. Feb 17-18. Tulsa, OK.
United States Department of Agriculture. National organic program: Final rule. Codified at 7 C.F.R., part 205.206(f). Available online at: http://www.ecfr.gov/cgi-bin/text-idx?SID=a6a0935ddf00e166695f4c2138bd58d8&mc=true&node=pt7.3.205&rgn=div5 (verified 3 March 2010). Gaus, A.E., H.F. DiCarlo, and C. DeCourley. 1993. Fresh market tomatoes [Online]. University of Missouri Extension. Available at: http://extension.missouri.edu/xplor/agguides/hort/g06370.htm#pruning (verified 3 March 2010). Kemble, J.M., L.M. Curtis, and T.W. Tyson. 2000. Guide to commercial staked tomato production in Alabama [Online]. Auburn University Extension Publication ANR-1156. Available at: http://www.aces.edu/pubs/docs/A/ANR-1156/ (verified 3 March 2010). Kelley, W.T. 2006. Production using plastic mulch. Commercial tomato production handbook [Online]. University of Georgia Cooperative Extension Bulletin 1312. Available at: http://pubs.caes.uga.edu/caespubs/pubs/PDF/B1312.pdf (verified 3 March 2010). Mississippi Cooperative Extension Service and Experiment Station (MAFES). 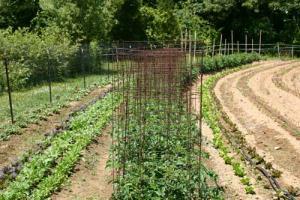 Vegetable gardening: Staking and training tomatoes [Online]. Available at: http://msucares.com/lawn/garden/vegetables/tomatoes/index.html (verified 3 March 2010).